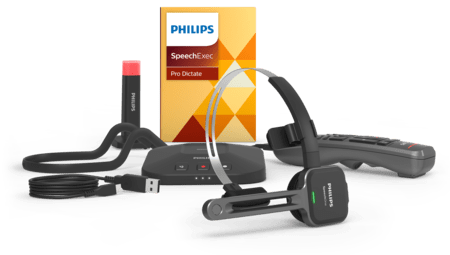 Philips SpeechOne Wireless Dictation Headset has been specially designed to match the needs of users who frequently use dictation or speech recognition to create documents. The premium decoupled microphone offers crystal-clear recordings, perfect for accurate transcriptions. Ultra-comfortable and ergonomic design, personalized wearing options and hygienic exchangeable cushions make the headset the perfect work companion in both hospitals and offices alike. The professional microphone guarantees accurate speech recognition results and transcriptions, even in noisy environments. Move away from your workstation and still record wirelessly in superior quality compared to Bluetooth and DECT. The modern ergonomic design ensures comfortable working, even after many hours of use. Benefit from a high-performance battery which lasts the entire work day. Reclaim control over your availability by clearly signifying to colleagues whether you are “available” or “busy”. If you share a device with other authors, you can each have your own personal cushions. The ergonomic remote allows you to conveniently control your recording application. The keys are freely configurable and can be personalized for any user and application. Comfortably communicate via Skype in crystal-clear audio quality without any additional installations.